Red Salute to Com. EMS on his 20th death anniversary! 19th March 2018 is the 20th death anniversary of Com. 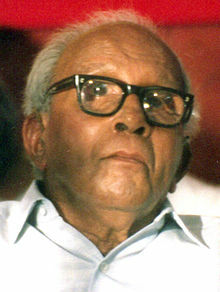 E.M.S.Namboodiripad, former General Secretary of CPI(M) and the first Chief Minister of Kerala State. Com. EMS, as he was respectfully called, was one of the finest intellectuals of the century, in addition being an ideologue as well as a practical Communist. His first Ministry of 1957 passed the Land Bill which benefited lakhs of landless in Kerala. The Education Bill was another feather in his crown. Com.EMS has got close connection with the P and T Trade Union movement. It was he, who inaugurated the All India Conference of E.III Union in Thiruvananthapuram in 1994 in which I was elected as the General Secretary of E.III Union. I still remember what he told in his speech. ‘It is necessary that both the intellectual worker as well as the manual worker should join together for safeguarding the industry’ he stated. How true! It is based on this advice that we started co-ordinating the associations of executives and unions of non-executives in BSNL. At one stage, we were even able to bring the ITS Association also in the Sanchar Bhawan March. We remember the great contribution he has given to the Communist movement and the working class. Red Salute to Com. EMS on this 20th death anniversary!